Years ago, young and impoverished, I tamed my sloping backyard with tiers of recycled railroad ties. Decades later, the decaying steps oozed creosote and housed carpenter ants. But when I went to replace them with a more durable solution, I realized I would miss the plants now growing in every crevice. So I set about designing long-lasting stairs that would provide the same interest as my old, rotting wood set. For several months, I walked around Seattle looking for interesting stair designs. I saw many unique ideas especially in older, middle-class neighborhoods with established, creative gardens. My favorite design looked like rocks stacked up under each tread. However, the rocks did not appear to be anchored and looked precarious. I decided to build my new stairway using pre-cast, hollow cement blocks topped by solid cement treads. I would set the blocks to create planting pockets, and they would provide a face where I could affix a pebble mosaic. The space was carefully measured and the soil was cut for nine stairs. Anatomy of the mosaic stair project. 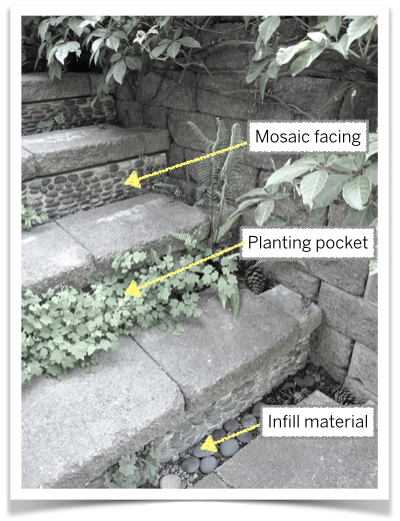 I designed my stairway so that water naturally penetrated each planting pocket. Spaces between each vertical block and a four-inch gap at the back of each horizontal tread were filled with soil. These channels effectively allow water to percolate throughout the stairway and encourage plant roots to spread out and establish. I spent one winter making pebble mosaics in frames I built to face each stair riser. Once the mosaics were completed, they were glued to the face of the cement blocks. Occasional gaps provided access to the planting pockets. Now came the fun of choosing what each planting pocket would hold. Dwarf lady’s mantle (Alchemilla erythropoda) and Pseudofumaria alba subsp. acaulis (syn. Corydalis ochroleuca) were chosen for the shadiest pockets at the base of the stairway, and I planted Mexican daisy (Erigeron karvinskianus) in sunnier pockets at the top. An assortment of diminutive ferns, including Dryopteris filix-mas ‘Cristata Martindale Dwarf’, Asplenium scolopendrium ‘Marginatum’, Asplenium trichomanes, and Dryopteris affinis ‘Crispa Gracilis’ filled the other spaces. 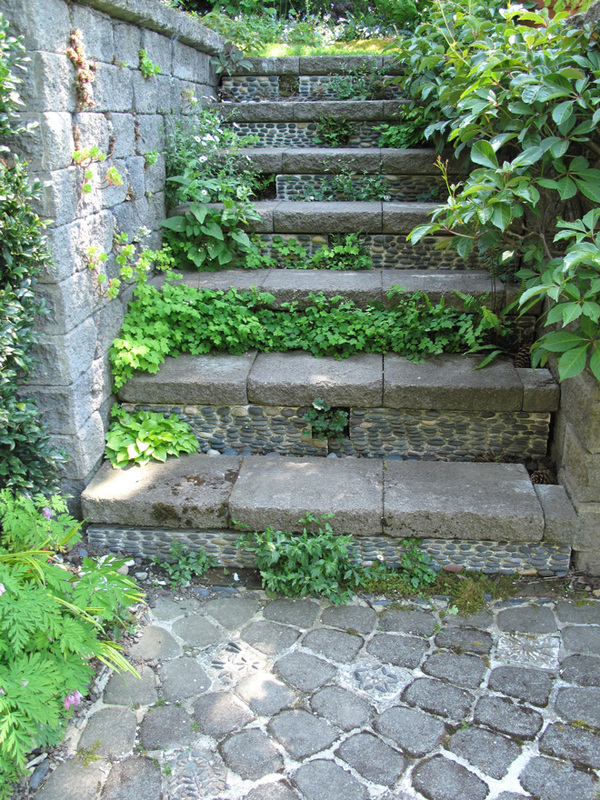 In the planting gap behind each tread, I repeated the Erigeron and also included Vancouveria hexandra, Filipendula vulgaris, Blechnum spicant, Alchemilla mollis, and a dwarf hosta called ‘Surprised by Joy’, some of my favorites from my original stairway planting. In the middle of the treads, where I didn’t want plants for safety reasons, I filled in with a variety of different materials: seashells on one level, crushed hazelnut shells on the next, black rocks like those used in the mosaics, and pinecones in another. That is not to say a few self-sown wild strawberries (Fragaria) haven’t made their way into those spaces, but they exist at their own peril. My finished stairway project—mosaic work, plants, and fill material—is unique at every level and the final design charms visitors to my garden.